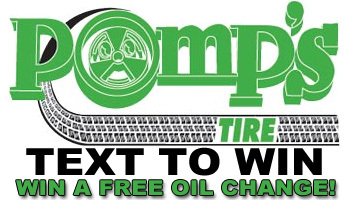 Pomp's Tire Text to Win | Upper Peninsula of Michigan Radio - Yooper News, Interviews, Pictures, and Calendar of Events - Great Lakes Radio, Inc.
Be sure to listen every weekday between 4 p.m. and 5 p.m. for your chance to win a full service oil change, courtesy of Pomp’s Tire in Marquette. Just listen for the Text to Win Keyword, and text that word to 361-WFXD that’s 361-9393! B) For a sweepstakes in which the winner is determined by random pick, the sweepstakes ends at the time announced on WFXD.. The method of winner selection (random drawing or ordinal rank) will be announced on WFXD at the time the sweepstakes begins. The computer clock of WFXD is the official timekeeping device of the Contest. There are two methods of entering sweepstakes governed by these rules: You may enter by using the text messaging feature on your cellular phone to send to a text message to 361-WFXD – that’s 361-9393 – with “code word” announced on WFXD in the body of the message. All entrants must have a text messaging two-way capable handset and digital service in order to enter the Sweepstakes using the text messaging method. Text-Message entries may be subject to fees under the terms of the entrant’s cell-phone/text messaging subscription plan (contact your carrier for pricing plans and details). Text messaging and wireless service are not available in all areas. If any dispute arises as to identity of any entrant, an entrant shall be considered the authorized account holder by the cellular provider. “Authorized Account Holder” is defined as the natural person who is assigned a number by the cellular provider or as shown on the cellular provider’s records or the natural person authorized to use the number by an entity that is shown on cellular provider’s records for that number. Only entries to the designated number and containing the correct keyword shall be eligible. Sponsor reserves the right in its sole discretion to disqualify any text message entry at any time which in Sponsor’s opinion does not comply with these Official Rules. The alternative to entry by text message is to enter online via e-mail. You must provide all information requested on the entry form, including name and telephone number. You must also have a valid e-mail account in order for your entry to be eligible. Incomplete entries will be disqualified. Copies or other mechanical reproductions, facsimiles, entries containing technical or electronic reproductions, entries containing attached files are not eligible and will be rejected. In the event of a dispute regarding the identity of an entrant, the holder of the e-mail account will be deemed the person who submitted the entry. Entries become the exclusive property of Sponsors and will not be returned or acknowledged. Limit one entry per person/e-mail address per day. Multiple entries from the same person on the same day will be disqualified. Limit one entry per household. Sponsors are not responsible for entries that are lost, late, misaddressed or misdirected due to technical or computer failures, errors or data loss of any kind, lost or unavailable internet connections, or failed incomplete, garbled or deleted computer or networks transmissions, inability to access the website or online service, or any other technical error or malfunction. This contest is void where prohibited by law. This contest is open only to legal residents who are 18 years of age or older as of the announcement of each individual sweepstakes.. Employees of other media companies (including television and radio), Sponsor and its parent corporation, subsidiaries, or affiliates, and such employees’ immediate family or household members are not eligible to enter or win the contest. For sweepstakes in which the winners are determined by ordinal rank of entries, all valid entries will be ranked in the order they are received. The people whose entries have the ordinal ranks originally announced for the sweepstakes will be declared the winners and contacted by phone. For sweepstakes in which the winner is determined by random drawing, all valid entries will be combined into a single pool, and from that pool winners will be selected in a random drawing within seven (7) days of the end of the sweepstakes and contacted by phone. If sponsor is unable to speak to the winner by phone within 2 hours of being contacted by phone, an alternate winner will be selected and contacted by phone. If the alternate winner does not answer the phone upon being contacted, another alternate winner will be selected immediately. In the event of no response from the original winner within 2 hours of being contacted, the first alternate winner to answer the phone upon being contacted by the Sponsor will be declared the winner. All federal, state, and local taxes associated with the prize within the United States, as well as all other costs or expenses involved in or associated with the prize not specifically listed above, including any incidental travels or costs or amenities not set forth explicitly above or in the announcement of the sweepstakes on WFXD, are the responsibility of the winner. Prizes are not transferable or redeemable for cash, and prize substitution will not be allowed, except at the sole discretion of Sponsors. Sponsors reserve the right to substitute a prize of equal or greater value for the prize. The Winner may be required to present valid identification and to sign additional documentation in order to receive the prize. If the winner does not fulfill these requirements, the prize will be forfeited and a substitute winner may be selected. If for any reason, the text messaging portion of this contest is not capable of running as planned, including infection by computer virus, tampering, fraud, technical failure, or any other cause which corrupts or threatens the administration, security or integrity of the contest, Sponsor reserves the right, in its sole discretion, to terminate or suspend the contest or any portion of the contest. ANY ATTEMPT TO DAMAGE OR UNDERMINE THE FAIR AND LEGITIMATE OPERATION OF THIS CONTEST WILL RESULT IN DISQUALIFICATION FROM THE CONTEST. Information submitted in text message entries, including entrant’s phone number, name, address, e-mail address, etc., may be used by WFXD for marketing or promotional purposes. Sponsors reserve the right to prohibit any entrant from participating in the Contest if, at their sole discretion, Sponsors find such entrant to be tampering with the entry voting process or if such individual repeatedly shows a disregard for, or attempts to circumvent, these Official Rules, or acts: (a) in a manner the Sponsors determine to be not fair or equitable; (b) with an intent to annoy, threaten or harass any other entrant or Sponsors; or (c) in any other disruptive manner. By participating in a WFXD text-to-win sweepstakes, you agree to have your name, photograph, voice, biographical information, and likeness used in any and all media for promotional purposes by Sponsors relating to this contest or future similar contests without further compensation or notice, except as prohibited by law. By participating in a WFXD text-to-win sweepstakes, you represent that you agree to be bound by these rules and the decisions of the judges and to release Sponsor, its parents, subsidiaries, affiliates, directors, officers, employees, and agents from any and all liability for any injuries, losses, or damages of any kind caused by any prize or resulting from your participation in this contest and your acceptance and use of any prize.